POWER OF POSITIVE SUMMIT STARTS TODAY! 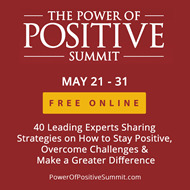 This free online event (May 21 - 31) features over 40 brilliant thought leaders and experts sharing strategies on how to stay positive, overcome challenges and make a greater difference in the world. Speakers include: Jon Gordon, Tony Dungy, Roma Downey, Alan Mulally, Michael Hyatt, Lysa Terkeurst and many more. My wife and I celebrated our 21st wedding anniversary on Thursday last week. It seems like yesterday when we met for the first time. She was walking down the street in Buckhead, Atlanta and I was standing outside a restaurant that I had just opened. I was 24 and she was 27. For me, it was love at first sight. For her it took a while :) but 21 years later we have learned and grown a lot and I want to share some of our relationship lessons. I hope they help you with your relationships. 1. Choose Wisely - One of the most important decisions you will ever make is the person you marry. Choose wisely. 2. You Know You Are With The Right Person When They Give You Strength - Looking back on my life and marriage, there's no way I could have done it without my wife. Her love, support, belief and encouragement gave me strength. She believed in me when no one else did and gave me the confidence to pursue my dreams. 3. Be Willing - Early in our marriage our relationship wasn't very good. I was young, selfish and quite negative. One day she had enough. She said "I love you but I'm not going to spend my life being married to someone who is so negative and miserable and who makes me miserable. You have to change." I looked at myself and my life and realized she was right. I looked up and asked what my purpose was. I looked at my computer and began to research ways I could be more positive. I looked ahead and began to take "thank you walks," pray and write. I was willing to change and it led me to do the work I do now. I was willing and I became a positive influence on my wife, children and others. So, be willing to improve and grow. You'll benefit your marriage and the world. 4. Communicate, Communicate, Communicate - Most relationships initially break down because of poor communication. It's so important to keep the lines of communication open. My wife and I have had our share of disagreements over the years but we always communicated and this allowed us to grow strong together. Eventually we learned to talk, listen and hear. 5. Take One for the Team - Speaking of fighting, it's important to admit when you are wrong. I certainly have been wrong many times and have admitted it. I also have admitted I was wrong even when I didn't think I was. I knew my wife was bothered and I knew it was more important for her to feel loved than for me to feel right. I took one for the team so we could be a stronger team. I lost the battle but we won the war. Please know this hardly ever happened in the first half of our marriage. It takes maturity and a willingness to focus on your spouse and marriage more than your ego. 6. The More I Love My Wife the More I Love My Life - I'm not talking about the popular phrase happy wife, happy life. I'm talking about the fact that the more I focus on loving and serving my wife, the better I feel about myself and my marriage. It's not about what she does for me. It's not about keeping score. It's about me deciding to be selfless and love her, serve her and be there for her. I've found when I do this we both get better. 7. Encourage Instead of Compete - My wife and I have met a lot of couples over the years who seem to compete with one another. They get jealous if their spouse is getting fit or enjoying success rather than encouraging and supporting them. Instead of being one team they act like they are two separate teams. To have a great marriage you have to be one team who supports and encourages each other. When you support and advocate for each other you grow as individuals and also strengthen your team. 9. Have a Shared Mission - My wife and I knew that we weren't together just for ourselves. We felt our mission was and is to raise champions in life that will make a difference in the world. This mission and purpose influenced every decision we made and continues to influence us. We know we aren't perfect parents and have made mistakes along the way, but our mission inspired us to give our very best. 10. 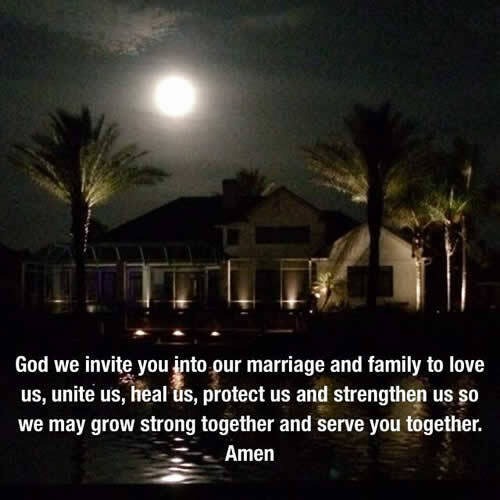 Invite God into Your Marriage - Years ago when we hit a rough patch in our marriage I met a guy on a plane who told me he and his wife say a prayer before bed each night. So I prayed and asked God what our prayer should be. It came to me a few days later and we have said it each night ever since. It's made a big difference that has lead to forgiveness, healing and growth. 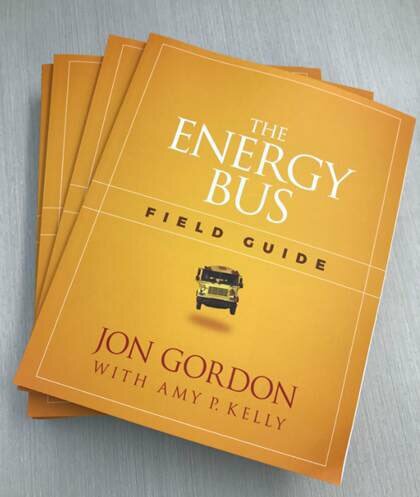 The Energy Bus Field Guide, a companion to The Energy Bus book, is a comprehensive action plan filled with case studies and best practices for individuals, facilitators, trainers, teams and organizations. Available where books are sold including Amazon and Barnes & Noble.